Thank you very much and thank you to all the media members and the fighters for being available today on this call. I’m really happy to talk a little bit about this upcoming fight. Clearly this is the fight of the summer. Probably going to be a Fight of the Year candidate. It’s one of those can’t miss fights and whenever you have champion versus champion, undefeated versus undefeated, you know that the fight fans are in for a special treat. 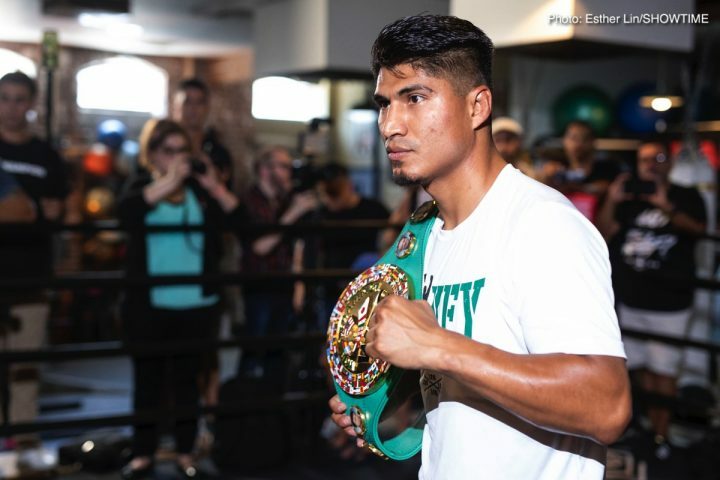 Mikey Garcia versus Robert Easter Jr. for the Unified Lightweight Championship of the World, two fighters in their prime challenging themselves for greatness. Premier Boxing Champions presents this fight, a truly premier event from the premier venue in the United States, the STAPLES Center, Saturday July 28th. It seems whenever you have a fight at the STAPLES Center they always exceed – not only live up to, but exceed their expectations. The STAPLES Center is the kind of venue with the way it’s built and the way the crowds are embracing their fighters there in the center ring, it always brings out the best of the athletes performing at the STAPLES Center. It’s a 15-fight card and yes you heard right: 15 fights are on the card. I don’t really remember ever having promoted a card with that many fights and the good news is it’s not just like a pileup of fights. It really is a great card top to bottom. As part of the tripleheader on SHOWTIME, we are going to have one of the best heavyweights, Luis “King Kong” Ortiz on the card and we have one of the most exciting young junior welterweights in Mario Barrios. He’s undefeated with 21 wins, 13 KOs from San Antonio. We will have him on the card as well. Also Fabian Maidana, Marcos Maidana’s brother, who is quickly make a name for himself. He’s 15-0 now with 11 KOs so make sure you keep an eye on him as well. And then the most talked about elite prospect from the U.S. from the Olympics – Rio Olympics in 2016 Karlos Balderas will be returning to the STAPLES Center as well. He’s 5-0 now. Tickets for this boxing extravaganza and that’s what it really is, are starting at $50. We do anticipate a huge crowd at STAPLES Center. We saw that with the last fight we did there with Mares and Santa Cruz. Huge lines formed the day of the fight, people buying tickets last minute. So if you do intend to go I would suggest that fans do go and buy their tickets now. I want to thank the man who made it all possible, who’s passionate about the sport, passionate about the fighters he advises and manages and that is of course Al Haymon. I would like to thank the entire Haymon team. It’s always a pleasure to work with them. And then of course I like to thank our co-promoter, the President and of TGB Promotions Tom Brown. Now for those who can’t make it to STAPLES Center of course the fight will be shown live on the number one boxing destination and that is SHOWTIME. SHOWTIME clearly is number one and no one out there comes even close. Their continued commitment to the sport, with the best fighting the best, champion versus champion and in this case here a unification fight, a stacked card and the man who makes that possible is a good friend of mine and he is first and foremost a boxing fan himself and he is of course President Sports & Events Programming, Showtime Network Inc. Stephen Espinoza. Thanks very much Richard. Appreciate that introduction. This fight which we are all very excited about, champion versus champion, will be the third world title unification fight on SHOWTIME just this year. We’ve spent the last two or three years trying to ramp up and position things so that 2018 and maybe ’19 will be periods in which we will see these kinds of unifications. So we’ve done all the work, the fighters have done the hardest part and I’d like to recognize both Mikey and Robert Easter Jr. for taking this fight and taking this fight with no delay. There is a long history of exciting lightweight unification fights on SHOWTIME. In fact, the last lightweight unification fight on SHOWTIME was of course Corrales versus Castillo in 2005. So those are big shoes to fill but I think there’s a tremendous matchup with two very skilled fighters. Both Garcia and Easter are coming off victories in world title fights on SHOWTIME, Mikey defeating Sergey Lipinets for the 140 title and Easter making the third defense of his title versus Javier Fortuna. Mikey Garcia since coming back from his layoff has quickly risen to a top five pound-for-pound consensus fighter. In four fights on SHOWTIME since returning he’s won world titles in two different divisions. The one thing that speaks well about Mikey among many things is that he seeks out the biggest and toughest fights. We’ve seen that over and over again. In this particular case no one’s rushing to fight Robert Easter Jr. He’s a tall, athletic and skilled fighter and no one really is anxious to fight him other than Mikey, who didn’t hesitate at all. This is Mikey’s first fight in Southern California in seven years. Last time he fought here was 2011. I know, having discussed it with Mikey, that it was important to him and he’s going to put on a good show for the crowd. Robert Easter Jr. is in fact the longest current reigning champion at135 pounds, who won his title in 2016. He has rare physical gifts, 5-foot-11, 76-inch reach. That gives him a big height and reach advantage over Mikey and part of what makes this an intriguing matchup. You add in Luis Ortiz and two really interesting young super lightweights in Mario Barrios and Jose Roman, and we’ve got a really exciting triple-header on SHOWTIME. Thank you very much Stephen. It’s a pleasure now for me to introduce to you Team Easter. Robert has been waiting for a moment like this, a world champion, undefeated, and a big-time fighter. A champion like Robert Easter Jr., they like to challenge themselves against the best. And when the fight was offered to him against Mikey Garcia, he didn’t hesitate a second. He said where do I sign? In fact, he’s been looking for this fight because he knows in order to become the best and the biggest you need to fight the best and the biggest. He’s undefeated, a huge crowd attraction in Toledo, Ohio. With Kevin Cunningham he has a world class trainer in his corner. I’d like to acknowledge Kevin as well as Robert’s father, Mr. Robert Easter, Sr. Kevin certainly knows how to train and he knows how to get the best out of world champions. He is a very smart trainer and he knows how to come up with the right game plans to win fights. And as it relates to Robert Easter Jr., when he lands next week here in Los Angeles let there be no doubt about it: he’s not coming here to deliver a belt. He’s coming here to pick up another one. And it’s a pleasure for me now to introduce to you the undefeated lightweight world champion Robert Easter, Jr.
Camp has been really good. We had a long camp, nine-plus weeks and just staying focused and staying sharp and everybody in has been waiting for this fight and this moment for a long time. I believe this fight is what boxing deserves, champion versus champion. I’m no stranger to tough fights. This is going to define my career and make the best out of me, fighting another best great fighter. This fight with Mikey Garcia is one of the big fights that I’ve been waiting on for so long and it’s finally here. July 28th and we’ll see one of the best you’ve ever seen. I’m going to bring in plenty of skills thanks to my coach Robert Easter, Sr. and Coach Kevin Cunningham. We’ve made adjustments and changes in my game and everything is coming out perfect. July 28th you will see me with two belts. Given your fights against Javier Fortuna and Richard Commey would you call this fight against Mikey by far the biggest of your career given the stakes? Yes of course, I look at every fight like it’s big. Of course with this one being another champion it is even bigger. So we train hard for every fight and we look at every opponent the same. We don’t just favor just one opponent. I step in there I step in the ring with my life on the line. What advantages do you feel you have over Mikey that will enable you to beat him on July 28th? My height and my speed and my power. My ability to box will keep him away and eventually I’ll be able to finish get off the power punches I want. Robert how do you feel that you fought in your fight against Javier Fortuna? What did you like about your performance and what did you dislike about it? I believe I fought that fight wrong and made it tougher on myself. Instead of using my reach and my ability to box, I sort of smothered my punches. But when I fight I move on from it, we learned from it as well as every fight. Was that the fight that really convinced you to go with Kevin after what happened in that fight? No. What convinced me to go to Kevin is, to just switch it up, make things less comfortable for me. I was too comfortable in Toledo having things my way, doing things my way and just around too many distractions. Kevin also can you assess how Robert fought against Javier Fortuna and what you thought about his performance in that fight? Well I thought after watching the fight I thought the fight could’ve been a lot easier for Robert just if he had used his natural gifts in terms of the height and reach and control and range and distance. Like he explained, he knows the mistakes that he was making in the fight. He was not using his range properly, not controlling distance and then smothering his punches by fighting in a little too close and giving up his height and things of that nature. Robert understands what he needs to do to, the adjustments that he needs to make. He’s got the ability and the skill to pick it up going back, pick it up. He’s really looking sharp and I just think that he’s really going to put on a show come July 28. I know you are friends with Adrien Broner and Gervonta Davis and everything. So I was just wondering if perhaps on the night of April 21, when both of those fighters had their debut bouts with Kevin in their corner, was there anything specifically that you saw in those performances for both of those guys that convinced you that maybe Cunningham was the move for you for this type of fight? I saw the focus and the shape those guys were in. Plus, every step of the way I was calling Adrien. I was on the phone with him throughout the camp. And I was seeing videos and he was telling me things they were doing. I’m pretty familiar with Coach Cunningham anyway, growing up and I’d see him in the amateurs and of course in the pros. Plus he from the Midwest so it was like family. So he welcomed me in with open arms, and there you have it. I’m here at camp with him and we cooking up something for July 28. Did you watch the kind of exchanges that Broner and Cunningham had in the corner and is that something that you think could be beneficial on July 28? Of course. That’s a big reason why I made this move to come down here and be in Coach Cunningham’s program. Like I said, being back at home, I had a lot of distractions and my mind was everywhere and I couldn’t focus just on boxing. So whenever I was in the ring, I was never sticking to a game plan. So making that move with Coach Cunningham, he made me focus on our game plan and nothing but our game plan. That’s all I’ve been focused on, is boxing, period. Being away from home and all the distractions, all I can think about is boxing. Coach Cunningham, the influx of these world-class guys coming down to Florida to work with you, what has that meant to you professionally? Well, I appreciate the fact that a lot of these guys appreciate me really giving them 110% if they make the decision to come to my camp. So, we kind of reciprocate the appreciation with each other. It’s all work and no play down here. It’s just a tremendous situation for these guys. Any time you come and put the work in, like Robert for instance, his camp will be, weeks when it’s over and he left no stone unturned. He sacrificed everything. He did everything that was asked of him. And he’s a talented guy. He’s naturally talented. We have a tremendous game plan. He’s been a pleasure to work with. Excellent. Thank you very much. I want to thank Robert and Kevin, Team Easter for being on the call and making themselves available. I know we are in the final days of training and I know you’re going to be traveling out here soon to Los Angeles. Looking forward to seeing you all and welcoming you to STAPLES Center for this big unification bout. So good luck and I’ll see you guys next week. So let’s move right along. It’s a pleasure for me to introduce to you Team Garcia now. We have pound-for-pound trainer Robert Garcia on the line and we have the No. 1 pound-for-pound fighter Mikey Garcia on the line. Both will be available to answer questions. Mikey’s an athlete who keeps challenging himself to fight the best. He seeks out the most challenging and biggest challenges. And in this fight here, I mean biggest as well, literally. With Robert Easter, Mikey will face a fighter who possesses skills and power and is obviously naturally gifted with his height and reach advantage. But Mikey is a four-division world champion. He’s moving up and down these weight classes as if they don’t exist, always finding a way to solve the most difficult and most challenging puzzles. In fact, he’s only the third fighter in modern history to be a champion, a world champion, at 126, 130, 135 and 140 pounds. And I have that sneaky feeling that he’s not done yet. He’s a man who is driven to make history. This is Mikey’s first unification bout. It’s Mikey’s first fight in Los Angeles for I believe seven years. And he knows where he is going to perform on Saturday night and it is a building which is reserved for the biggest stars in sports and in music, and that’s the STAPLES Center. I know that Mikey will be ready for this challenge, for any challenge. It’s a pleasure now for me to introduce to you the undefeated superstar, the undefeated world champion and the undefeated pound-for-pound No. 1 fighter in the world, Miguel Angel “Mikey” Garcia. Well, you know, camp is winding down now but camp went very well. We had a nine-week camp and great sparring, greater number of rounds. I’m excited for the fight. I’m very happy that we happened to land a unification match. It’s big fight for me in my career. I’m happy it could land it here in L.A. It’s even more wonderful. I get to experience this fight with my local supporters. And so I couldn’t ask for anything else. I think everything is going very well and I’m just very happy. From what you’ve seen of Robert Easter Jr., what does he bring to the table? And what are you going to have to be most watchful for? Well, I’ve seen him on several occasions and he’s a fighter. He’s had some tough fights and I think he’s had those tough fights because he allows it to get tough for himself. Because he’s a fighter, he likes to fight. He likes to exchange punches and gives up the height and reach advantage at times. But he’s always in the fight. He’s always punching. He’s dangerous. He has power. I think he might actually use his height and reach early on. So that’s something I have to be aware of. I have to be prepared. And that’s what we did in the gym. We worked on a lot of things to overcome those height and reach advantages. But I’ll make those adjustments. I have experience fighting a lot of different opponents, different styles, different heights. I’d say I’ll be prepared to do whatever it takes to win on the night of the 28th. Hey, Richard, just really quick. How are the ticket sales going for this event? Tickets are going excellent. Actually, some of the price categories, we’re sold out and we’re having a meeting this afternoon with the STAPLES people to see if we can open up some more. So I do anticipate a very big crowd, a fantastic crowd. The fight fans are here in L.A. They love a great fight. They love a big fight and they’re going to show up. With Mikey Garcia, they have somebody who’s a local guy, who they can cheer on and who they can support. With Mikey Garcia, they have a pound-for-pound No. 1 in the world and he’s coming from right here, from Los Angeles. So fans will show up. Mikey it’s your first time back at 135 for the last couple of fights, how’s your body reacting to it? Are you feeling comfortable getting back at the weight? Yes, I’m comfortable. We had, like I said, a long camp with nine weeks. And the right eating, the right diet allows me to be able to fluctuate in weight and come back down to 135. I feel strong. I feel fast. I feel very healthy. You’ve fought at lightweight and super lightweight. Which division do you feel more comfortable in? Or does it matter to you at this point? Well, I feel comfortable at both divisions. I feel fast and strong in either division. But I do feel that I’m at a disadvantage when I’m fighting at super lightweight, 140 pounds. Those guys are naturally bigger and carry more weight. But I feel the same as far as my abilities go. And that’s why I’m able to fight in both divisions because I feel fast and strong in either one. Fighting at lightweight, I think it’s more of an even category, weight class. Even though my opponent this time around is a lot taller and has a lot of reach, we weigh the same. I don’t feel that that’s going to be any factor, when it comes to fight night. But I feel comfortable really. I honestly do feel comfortable in both divisions. Looking at Robert’s length and his reach, Javier Fortuna found a lot of interesting ways to get inside of him. I’m wondering, did you study that fight? And did you pick anything up that Javier Fortuna did that you could capitalize on? Well, I’ve seen the fight. And believe it or not, Javier Fortuna has a weird, awkward style that makes everybody have problems. He’ll give problems to anybody no matter height or reach. Javier Fortuna is tricky, experienced, a former champion. Robert Easter Jr., sometimes gives up those height and reach advantages on his own because he’s a fighter, because he likes to fight and exchange punches and looks for a knockout. And that’s part of the reason why Fortuna had some success in a really difficult fight. But overall, I still felt that Robert won and did enough to win that fight. Given the stakes of his fight, does the fact that you’re fighting in Los Angeles make the fight even more special than your previous ones? Well, it’s a big fight for me. I’ll be unifying titles at lightweight so that’s a big accomplishment and it does make it more special because it’s here in LA, in Southern California, my home. I get a chance to give my local fans and people a chance to support me and an opportunity to see me live for the first time in seven years. I’ve been fighting in Texas and New York and out of other states. So, it’s very special for me to be here. I know I have a lot of family, a lot of support, a lot of fans out here in France who sometimes can make the trips out and this time they’re definitely going to be here so that makes it a little more special. I know there’s been some chatter about you potentially moving up in weight again or looking at other big fights, does it become tough at times to not look ahead of your current fight or is it you just not pay mind to that kind of talk and chatter? Well, I will discuss anything — any options available, any name that’s being mentioned, I have no problem with. It doesn’t distract me from my opponent in front of me. Robert Easter Jr. is a tough fighter who I have to take very seriously and I do and that’s why we did a nine-week training camp and got the great sparring, got the right training, the right diet–everything. But speaking about other opponents, other fighters in the possible future doesn’t affect me at all, , I’m willing to speak and discuss anything with anybody. Richard, are you expecting attendance number around the last fight at STAPLES Center? A lot higher? Lower? No, I expect an attendance number around that ballpark, maybe even more. When I started working with Mikey, one of our goals was to really start making the STAPLES Center at least once a year, the home for Mikey Garcia. Before that, before that fight we did with Mares and Santa Cruz, it has been quite a while before STAPLES Center had a fight card. But to be able to make STAPLES Center your home was one of the goals and Mikey’s a very ambitious guy and he set many other goals which, I’m sure, at due course he will discuss with you guys. But, you know, to fight in STAPLES Center is a big thing and Mikey’s the right guy and he will be the king – the king of LA and the king of boxing and to pound-for-pound king and all of those kings, you watch and see. Do you consider this a chance to really to make your statement that you are, indeed, not only the king of the lightweight division but also pound-for-pound? So, I always have believed I’m the best and that’s why I’m taking on these fights to prove to everybody that there’s no one else better than me, there’s no one else equal to me and these are the fights that excite me the most and will cement my name. How important is it to fight an undefeated fighter like Easter? I’m looking for the most attractive fights, most important fights for me in my career and I want fights just like this, undefeated champions. I’m fighting champion after champion, those are the fights that will excite me the most and motivate me the most. I could easily be defending my title against top contenders in the top ten, but if they haven’t been champions or their record’s not perfect, it doesn’t really excite me, it doesn’t motivate me. But that’s why I’m facing guys like Dejan Zlaticanin, Sergey Lipinets — undefeated champions. These are fights that really motivate me and excite me because in the end, I want to leave my name cemented in the history books of boxing. I saw that you were at the ESPY’s yesterday, and you were there, it’s across the street from STAPLES Center, did you have any thoughts about your fight when you were leaving and taking a look at the arena? Did you think about your fight? Or did you tell people anything about it? Well, I was just excited to be there and I’m looking forward to next week when I come back and fight in front of all my local fans. It’s exciting to be there at the red carpet, meeting all these athletes and just being around that atmosphere is great at the ESPY’s. But my task next week is most important and that’s what I’m looking forward to. When you were an amateur boxer and you were fighting in the Golden Gloves, like right there in the Lincoln Park, did you ever have dreams of fighting at STAPLES Center? Well, I remember going to STAPLES Center to watch some of the fights there and it’s always just nice to be in that arena and I’ve seen some of the fights there and I also would, obviously, have the dream to one day be there. I remember going to some concerts there and I’ve seen Jay-Z there and to go to the arena and I’m like, wow, one day I’m going to be there and I’m going to be fighting here and now I get to do that and experience it this week, so I’m very excited for it. It’s been a goal ever since I started, fighting title fights and were never allowed and never had the opportunity to fight at STAPLES. It’s what I wanted to do and now I get to do it, so that’s what’s making this that much more special. Robert, do you think that Mikey’s gotten the credit for what he’s done? Do you think he’s gotten the proper recognition so far? I think so, as of now, I think he does. Particularly people who know the talents and the skills that he has and he does get a lot of credit for what he’s accomplished. Robert, what do you think of the challenge that Easter presents for Mikey next week? Easter is a typical fighter. He does have a five-inch height advantage and eight-inch reach advantage, so that’s a big difference so I’m sure he’s training and getting ready to use that advantage. So we’re doing the opposite, we’re training to beat him to that and it’s just going to make a great fight and all the fans are going to enjoy a great fight, the boxing world and people watching on SHOWTIME are going to enjoy a hell of a fight. How do you look at Easter having Kevin Cunningham as his new trainer for this fight? Kevin is a great trainer, he’s one of the best in the business right now and I’m sure he’s doing a great job in training camp and I can’t wait to see what kind of game plan they move with because I know he’s really good at that and he always brings the best out of the fighters. So I am excited to be part of it and I’m excited for the challenge. How has it been for you working with a guy in your first fight with them? Well, look, sometimes depends on who the fighter is, you know? A lot of times, I don’t know if that’s the case with Cunningham and Robert but some fighters, sometimes they just need a new voice, they just need somebody to call the shots like we say. They get too comfortable with the trainers, they start calling the shots, they start saying when they want to train, who they want to train with and where they want to train. I think it’s definitely going to benefit Robert Easter Jr and if that’s the case with him, I know Cunningham is very strict with his work and does a great job. Mikey, how much of a difference do you expect to see in Easter now that he’s working with Kevin Cunningham in this fight? Sometimes it just takes another person, another voice, to get the fighter to use what he needs to do. I think he’s going to try to use his reach and height advantage. I think they’re going to try to use that most of the night but that’s part of the fight, that’s part of the game and I have to make those adjustments to overcome that and find other ways to get to him. I think he’s going to be very motivated and probably in the best shape ever; he knows what’s at stake, he knows it’s a huge fight. It’s the biggest fight of his career as well so I’m expecting the best Robert Easter Jr. ever. Mikey, how much do you expect him to be able to resist what you’ve mentioned earlier, that he gives away his height and his reach but because he’s so willing to get in there and fight, do you expect him to revert back to that or you expect him to be able to use his height and reach a little bit better then in this fight? I think he’s going to use this height and reach a little bit more. I think that somewhere down in the middle of fight, maybe, midway in the fight, if things start getting heated, he might start to exchange with me on occasions but I think that’s where the trainer will come in. Cunningham will come in and remind him to stay away and use the reach and height again. It’s just part of being a good trainer, a good coach and reminding your fighter to stay in your game plan but I think there’s going to be moments where we are going to get in exchanges because that’s just who he is as a fighter. Excellent, thank you. Well we heard from Robert Easter Jr, we heard from Mikey Garcia, I think what’s very clear, even more so today after this call, that both are ready, both are motivated and both wants that other belt. On Saturday, July 28, right here at STAPLES Center, we will see the biggest fight of the summer, one of the biggest fight of the year, the unification between Mikey Garcia versus Robert Easter so hope to see you all there. We’re going to have some exciting things planned for next week, as well. On Wednesday we’re going to have some media workouts here in Los Angeles. On Thursday, it’s going to be the final press conference at the Congo Room in L.A. Live and then on Friday, of course, the weigh-in, at STAPLES Center and open to the public. Then on Saturday, at 3:00, the STAPLES Center doors will open for this fantastic 15 card fight-night in Los Angeles so make sure you tell all your writers this is truly the biggest card I can remember, maybe the biggest Los Angeles has ever seen with 15 fights and I’m so excited, can’t wait and see you all. Thank you.